Masterchef Australia is back for another season, season 4. I am quite disciplined with Masterchef shows actually. I’ve watched most of the episodes except for those nights which I’ve to stay late at work or dinner events. I’ve always loved Masterclass where they usually teach/show the contestants how to cook certain foods, the techniques involved and etc. It makes me happy when I can learn a few more tricks to my cooking. 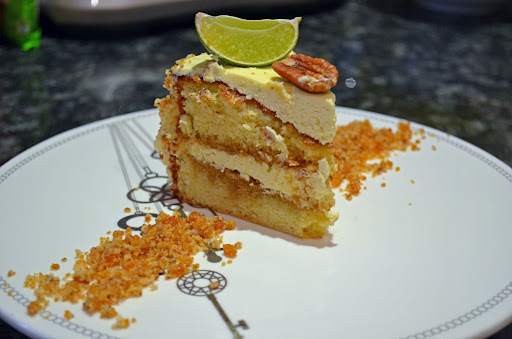 So two weeks ago, a British model-turned-pastrychef, Lorraine Pascal demonstrated her Mojito Genoise. A cake made from rum, mint, sugar and eggs. The moment I saw her making this cake, I am so intrigued and my hands were itching to make it right away. Great thing is that it was the long weekend for Queen’s birthday! Plus I’ve some friends over for avengers movies marathon the next night. So I thought to myself, this is the perfect time to make it. I was so excited! I’ve never made a genoise before, let alone, mojito genoise. I find it difficult to even say it! Anyway, a genoise is a cake with no raising agent in it. So how much the cake rise depends on how well the eggs were beaten. This cake involves a few steps: it has a sugar syrup for soaking the sponge, praline, buttercream for icing and the genoise sponge itself. Phew, it sounds complicated but it’s actually quite fun to make it! It’s also quite different from the other cakes that I’ve made before. This one has to be really gentle mainly because of the genoise. I was really happy with how well the cake turned out (still am actually). I think this is the prettiest cake I’ve made so far. It tasted good too, not too sweat due to the limes and I loved the praline. It was crunchy and the cake was soft, perfect! Preparation time + assembly: 2 hours. 1) Preheat the oven to 180 degree C. Grease a 20cm cake tin and line the base with baking paper. 2) Make the sugar syrup first to give the mint and lime plenty of time to infuse. Gently heat brown sugar with water, lime juice and rum (in my case, whiskey). Let the mixture boil for 2 minutes until the syrup thickens. 3) Remove from heat and add the mint leaves plus lime zest. Set aside to infuse. 4) For genoise sponge, bring a large pot with third full of water to a boil. The pot has to be big enough to fit the bowl that you’re going to mix the eggs in. 5) Remove the pot from heat and place the mixing bowl (with 6 eggs) over the top. Make sure the base of your bowl isn’t touching the water. 6) Using an electric hand mixer, whisk the eggs for 1-2 minutes to allow air in (you should start to see bubbles). Then slowly add the caster sugar. Place about a third of the caster sugar at the side and whisk in slowly. Repeat until all caster sugar are whisked in. This will take about 10 minutes. 7) Remove the pot of water. Whisk the egg mixture for a couple of minutes to cool it down. It should be sitting like a ribbon on top of the mixture when falling from the whisk. 8) Add the melted butter at the inner sides slowly, forming like a circle (Not at the centre). Folding it through gently. Repeat until all butter are added. 9) Then add plain flour around the sides, a third at a time. Folding it through gently. Repeat until all flour is added. Do not overfold as you’ll lose the air and the cake won’t rise well. 10) Pour the mixture into the prepared cake tin. If there is any lumps of unmixed ingredients, mix it quickly while pouring it into the tin. 11) Bake for around 30 minutes at 180 degree C. Check for doneness by the smell of cooked cake :p or skewer to the centre should comes out clean. Left it to cool. 12) For Praline, in a non-stick pan over medium heat, place granulated sugar. As it melts, gently scrap it off from the sides to the centre. Repeat until all sugars are melted. For perfect caramelisation, you should get a red-brown golden colour. It’s a really beautiful colour. 13) Quickly add the pecan nuts and stir in to mix. Do this quickly while the caramelised sugar is still hot. Pour it into a tray. If you do this slowly, the whole mixture will become like a rock (like a toffee). 14) When it has cooled, break the praline into the food processor and blitz them to even bits (see photos). 15) For the buttercream, combine butter, icing sugar, seeds of vanilla pods (or vanilla extract) and beat (using a whisk attachment) on low speed until all combined. Then whisk for about 5 minutes until pale and fluffy. Add the lime zests. Beat on low speed just for a few seconds just to incorporate zests to the buttercream. 16) To assemble, get a string (or cake separator). If using string, put it around the cake horizontally and as even as possible. Then slowly and gently pull the strings so it is effectively cutting the cake into halves. Be very careful and gentle if you are using this technique like I am! 17) Place the bottom of the sponge cake on a plate and brush generously with the sugar syrup prepared early. Let it soak through. 18) Then put a big dollop of buttercream on top of the sponge bottom and using a palette knife, spread the buttercream over the cake until it is levelled. 19) Take the top half of the cake and turn the cut side UP. Brush with more sugar syrup. Left it to soak. 20) Turn it back over and put it on top of the buttercreamed sponge (bottom sponge). 21) Next, cover the whole cake with the buttercream, including the top and sides, making sure it is as smooth as possible with straight sides and top. For the sides, using a palette knife, take a dollop of buttercream. Hold the knife straight and wiggle it around, turning the cake as you do it. 22) Put the cake in the fridge for 10 minutes or so to firm up a little. 23) Use the praline crumbs to coat the sides of the cake, by taking a handful of the praline and put on the sides. Do not worry if it is messy and lots of crumbs falling all over. Pick the fallen bits and gently pat all over the sides. 24) DONE! Now, gently indent the cake top into sections. This is to work out where you will place the whole pecans and lime slices. 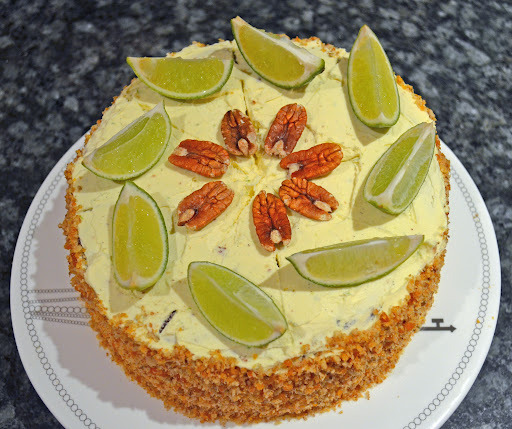 25) Top with one pecan and a slice of lime on each sections. Serve! 1) The way Lorraine Pascal prepared her buttercream is that she added all the ingredients onto the mixer at one go, cover it with a cloth and start beating them slowly. You can imagine that with the amount of icing sugar there, if she did not cover the mixer with a cloth, the whole kitchen is gonna be covered by icing sugar. 2) I’ve a different way of making the buttercream. I’ll beat the butter really low just to get it really softened, then slowly adding the icing sugar in ~200g portions while beating (using a whisk attachment). I actually added about 450-500g of icing sugar then tasted the cream. It is sweet enough for me so I stopped adding the remaining sugar. I don’t want the buttercream to be too sweat and overpowering. But if you’re a sweet tooth, go ahead and add till it’s to your liking. After adding the sugar needed, then I’ll whisk it for around 5 minutes until it’s fluffy and of nice consistency. 3) I put the cooled sponge on the fridge first just to firm the sponge a little for about 10 minutes before icing it. I find it is a better idea to cut the sponge into two halves first then the fridge. This way, it is easier to decorate with the buttercream as the sponge is already firmed up. 4) Be generous with the sugar syrup. The genoise sponge doesn’t has much butter so the sugar syrup will help to moisten the sponge further. I live in India currently, they showed that episode of MC Australia last nite, I googled for the recipe right after. a receipes must to try!! !